Die Veneris, 20 Julii, 1649. Attorney General in South Wales. ORDERED, That the Petition of Sir Trevor Williams Baronet be read To-morrow Morning. Ordered, That it be referred to the Committee of the Army, to consult with the General and Council of the Army, concerning the best Ways and Means of taking off Free Quarter, and of the Obstructions therein; and who the same may be removed: And that they meet as often as possibly they may, for that Purpose; and to hear the Complaints of such upon whom Free Quarter is taken; and give Redress therein. Ordered, That the said Committee do, from time to time, communicate to the Council of State their Proceedings therein; to the end they may confer with the General; and report their Opinions to the House. Ordered, That Mr. Weaver, Sir Michael Livesey, Colonel Morley, Sir John Trevor, Sir Henry Henman, Sir Henry Vane, Sir Peter Wentworth, and Mr. Temple, be added to the Committee of the Army. Ordered, That it be referred to the General, to take Order, That there be One Field Officer, at least, constantly residing with their respective Regiments, in the Places where the said Regiments are quartered. Ordered, That Mr. Holland make his Report from the Committee touching absent Members on Monday Morning next, the first Business. A Letter from the Lord Lieutenant of Ireland, of the Eighteenth of July 1649, was this Day read. Ordered, That this Letter be referred to the Committee of the Army, to take Consideration thereof; and present their Opinions to the House, What they think fit to be done therein. An Act, with further Instructions to the Trustees, Contractors, Treasurers, and Register, of the Lands and Possessions of the late Deans, Subdeans, and Chapters, &c. and for the better and more speedy Execution of the former Acts, Ordinances, and Instructions, made concerning the same; was this Day read the First and Second time; and, upon the Question, committed unto the Committee for removing Obstructions in the Sale of Deans and Chapters Lands. 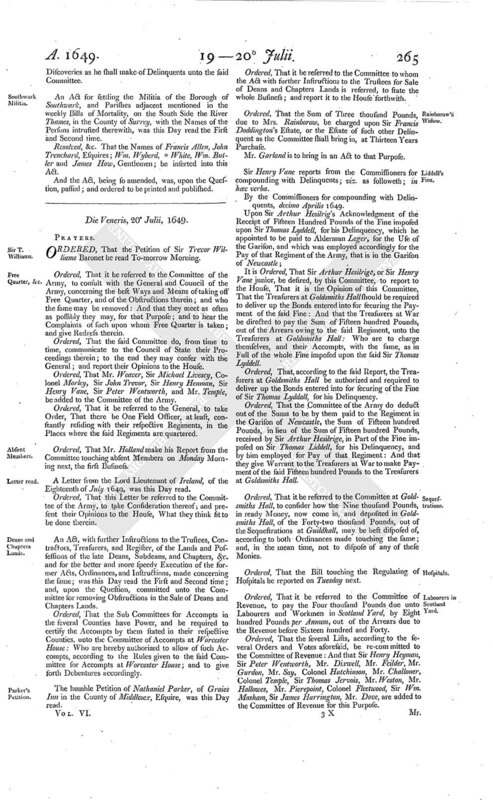 Ordered, That the Sub Committees for Accompts in the several Counties have Power, and be required to certify the Accompts by them stated in their respective Counties, unto the Committee of Accompts at Worcester House: Who are hereby authorized to allow of such Accompts, according to the Rules given to the said Committee for Accompts at Worcester House; and to give forth Debentures accordingly. The humble Petition of Nathaniel Parker, of Graies Inn in the County of Middlesex, Esquire, was this Day read. Ordered, That it be referred to the Committee to whom the Act with further Instructions to the Trustees for Sale of Deans and Chapters Lands is referred, to state the whole Business; and report it to the House forthwith. Ordered, That the Sum of Three thousand Pounds, due to Mrs. Rainborow, be charged upon Sir Francis Doddington's Estate, or the Estate of such other Delinquent as the Committee shall bring in, at Thirteen Years Purchase. Mr. Garland is to bring in an Act to that Purpose. Sir Henry Vane reports from the Commissioners for compounding with Delinquents; viz. as followeth; in hæc verba. By the Commissioners for compounding with Delinquents, decimo Aprilis 1649. It is Ordered, That Sir Arthur Hesilrige, or Sir Henry Vane junior, be desired, by this Committee, to report to the House, That it is the Opinion of this Committee, That the Treasurers at Goldsmiths Hall should be required to deliver up the Bonds entered into for securing the Payment of the said Fine: And that the Treasurers at War be directed to pay the Sum of Fifteen hundred Pounds, out of the Arrears owing to the said Regiment, unto the Treasurers at Goldsmiths Hall: Who are to charge themselves, and their Accompts, with the same, as in Full of the whole Fine imposed upon the said Sir Thomas Lyddell. Ordered, That, according to the said Report, the Treasurers at Goldsmiths Hall be authorized and required to deliver up the Bonds entered into for securing of the Fine of Sir Thomas Lyddall, for his Delinquency. Ordered, That the Committee of the Army do deduct out of the Sums to be by them paid to the Regiment in the Garison of Newcastle, the Sum of Fifteen hundred Pounds, in lieu of the Sum of Fifteen hundred Pounds, received by Sir Arthur Hesilrige, in Part of the Fine imposed on Sir Thomas Liddell, for his Delinquency, and by him employed for Pay of that Regiment: And that they give Warrant to the Treasurers at War to make Payment of the said Fifteen hundred Pounds to the Treasurers at Goldsmiths Hall. Ordered, That it be referred to the Committee at Goldsmiths Hall, to consider how the Nine thousand Pounds, in ready Money, now come in, and deposited in Goldsmiths Hall, of the Forty-two thousand Pounds, out of the Sequestrations at Guildhall, may be best disposed of, according to both Ordinances made touching the same; and, in the mean time, not to dispose of any of these Monies. Ordered, That the Bill touching the Regulating of Hospitals be reported on Tuesday next. Ordered, That it be referred to the Committee of Revenue, to pay the Four thousand Pounds due unto Labourers and Workmen in Scotland Yard, by Eight hundred Pounds per Annum, out of the Arrears due to the Revenue before Sixteen hundred and Forty. 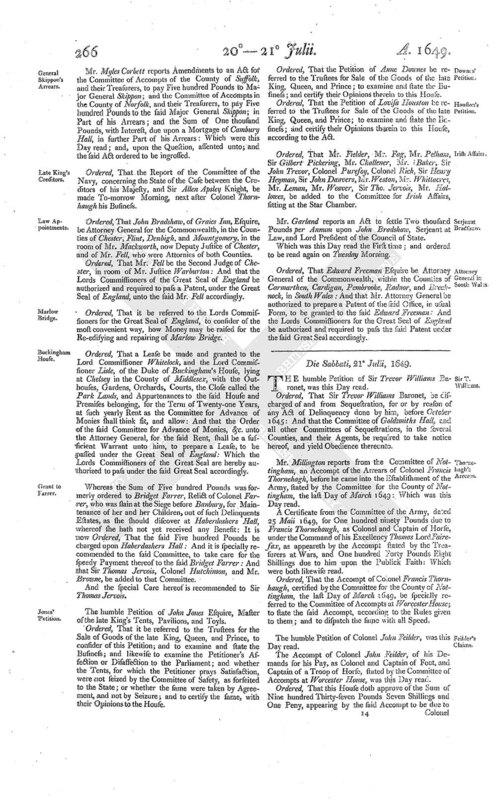 Ordered, That the several Lists, according to the several Orders and Votes aforesaid, be re-committed to the Committee of Revenue: And that Sir Henry Heyman, Sir Peter Wentworth, Mr. Dixwell, Mr. Feilder, Mr. Gurdon, Mr. Say, Colonel Hutchinson, Mr. Challoner, Colonel Temple, Sir Thomas Jervois, Mr. Weston, Mr. Hallowes, Mr. Pierepoint, Colonel Fleetwood, Sir Wm. Masham, Sir James Harrington, Mr. Dove, are added to the Committee of Revenue for this Purpose. Mr. Myles Corbett reports Amendments to an Act for the Committee of Accompts of the County of Suffolk, and their Treasurers, to pay Five hundred Pounds to Major General Skippon; and the Committee of Accompts in the County of Norfolk, and their Treasurers, to pay Five hundred Pounds to the said Major General Skippon; in Part of his Arrears; and the Sum of One thousand Pounds, with Interest, due upon a Mortgage of Cambury Hall, in further Part of his Arrears: Which were this Day read; and, upon the Question, assented unto; and the said Act ordered to be ingrossed. Ordered, That the Report of the Committee of the Navy, concerning the State of the Case between the Creditors of his Majesty, and Sir Allen Apsley Knight, be made To-morrow Morning, next after Colonel Thornhaugh his Business. Ordered, That John Bradshaw, of Graies Inn, Esquire, be Attorney General for the Commonwealth, in the Counties of Chester, Flint, Denbigh, and Mountgomery, in the room of Mr. Mackworth, now Deputy Justice of Chester, and of Mr. Fell, who were Attornies of both Counties. Ordered, That Mr. Fell be the Second Judge of Chester, in room of Mr. Justice Warburton: And that the Lords Commissioners of the Great Seal of England be authorized and required to pass a Patent, under the Great Seal of England, unto the said Mr. Fell accordingly. Ordered, That it be referred to the Lords Commissioners for the Great Seal of England, to consider of the most convenient way, how Money may be raised for the Re-edifying and repairing of Marlow Bridge. Ordered, That a Lease be made and granted to the Lord Commissioner Whitelock, and the Lord Commissioner Lisle, of the Duke of Buckingham's House, lying at Chelsey in the County of Middlesex, with the Outhouses, Gardens, Orchards, Courts, the Close called the Park Lands, and Appurtenances to the said House and Premises belonging, for the Term of Twenty-one Years, at such yearly Rent as the Committee for Advance of Monies shall think fit, and allow: And that the Order of the said Committee for Advance of Monies, &c. unto the Attorney General, for the said Rent, shall be a sufficient Warrant unto him, to prepare a Lease, to be passed under the Great Seal of England: Which the Lords Commissioners of the Great Seal are hereby authorized to pass under the said Great Seal accordingly. Whereas the Sum of Five hundred Pounds was formerly ordered to Bridget Farrer, Relict of Colonel Farrer, who was slain at the Siege before Banbury, for Maintenance of her and her Children, out of such Delinquents Estates, as she should discover at Haberdashers Hall, whereof she hath not yet received any Benefit: It is now Ordered, That the said Five hundred Pounds be charged upon Haberdashers Hall: And it is specially recommended to the said Committee, to take care for the speedy Payment thereof to the said Bridget Farrer: And that Sir Thomas Jervois, Colonel Hutchinson, and Mr. Browne, be added to that Committee. And the special Care hereof is recommended to Sir Thomas Jervois. The humble Petition of John Jones Esquire, Master of the late King's Tents, Pavilions, and Toyls. Ordered, That it be referred to the Trustees for the Sale of Goods of the late King, Queen, and Prince, to consider of this Petition; and to examine and state the Business; and likewise to examine the Petitioner's Affection or Disaffection to the Parliament; and whether the Tents, for which the Petitioner prays Satisfaction, were not seized by the Committee of Safety, as forfeited to the State; or whether the same were taken by Agreement, and not by Seizure; and to certify the same, with their Opinions to the House. Ordered, That the Petition of Anne Downes be referred to the Trustees for Sale of the Goods of the late King, Queen, and Prince; to examine and state the Business; and certify their Opinions therein to this House. Ordered, That the Petition of Lovisa Houston be referred to the Trustees for Sale of the Goods of the late King, Queen, and Prince; to examine and state the Business; and certify their Opinions therein to this House, according to the Act. Ordered, That Mr. Fielder, Mr. Fag, Mr. Pelham, Sir Gilbert Pickering, Mr. Challener, Mr. Baker, Sir John Trevor, Colonel Purefoy, Colonel Rich, Sir Henry Heyman, Sir John Danvers, Mr. Weston, Mr. Whittacres, Mr. Leman, Mr. Weaver, Sir Tho. Jervois, Mr. Hallowes, be added to the Committee for Irish Affairs, sitting at the Star Chamber. Mr. Garland reports an Act to settle Two thousand Pounds per Annum upon John Bradshaw, Serjeant at Law, and Lord President of the Council of State. Which was this Day read the First time; and ordered to be read again on Tuesday Morning. Ordered, That Edward Freeman Esquire be Attorney General of the Commonwealth, within the Counties of Carmarthen, Cardigan, Pembrooke, Radnor, and Brecknock, in South Wales: And that Mr. Attorney General be authorized to prepare a Patent of the said Office, in usual Form, to be granted to the said Edward Freeman: And the Lords Commissioners for the Great Seal of England be authorized and required to pass the said Patent under the said Great Seal accordingly.